Dr. Luis Manuel Tumialán has helped countless patients in and around the Scottsdale area experience restored wellness and mobility thanks to minimially invasive spine surgery and other treatments for back and neck pain. His primary goal is to ensure each patient can move without pain or discomfort and experience total wellness once again. We see patients who suffer from herniated discs a fair amount, which is why we'd like to go over the basics of the condition and how it can be treated. A herniated disc can also be referred to as a ruptured disc or a slipped disc. To understand what a herniated disc is, it's important to consider the basic anatomy of your spine. Between each vertebrae is a spongy cushion between these bones. This is a vertebral disc or spinal disc, which consists of a tough exterior with a softer center. The spinal discs act as shock absorbers for the spine and help with flexibility and proper range of motion. A herniated disc occurs when an injury to the back causes a disc to compress and bulge out of its regular position. This can lead to major pain as well as weakness in the back or limbs. The herniated disc can also irritate nerves of the back and cause numbness in the extremities. Some of the most common causes of herniated discs include heavy lifting and twisting and turning very suddenly. Auto accidents, hard falls, and other sudden blows or trauma to the body can potentially cause a herniated disc, but these instances are somewhat rare. Typically the injury has to involve overexertion of the back itself. Thankfully there are many treatments for herniated disc issues, and the vast majority of ideal treatments are non-invasive/minimally invasive in nature. If you experience a herniated disc, many times it's simply recommended that you get ample rest and take pain relievers and muscle relaxants. This will help with any issues related to severe soreness and allow you to go about your day with a limited amount of pain. In addition to the use of pain relievers and muscle relaxants, cortisone injections may be used to help reduce inflammation in the injured part of the spine. A number of physical therapy options can be considered for herniated discs as well, such as the use of heat packs or ice to address discomfort, the use of ultrasound or electrical stimulation therapy to help with pain or weakness in the back, and the use of braces to offer support for the injured area. 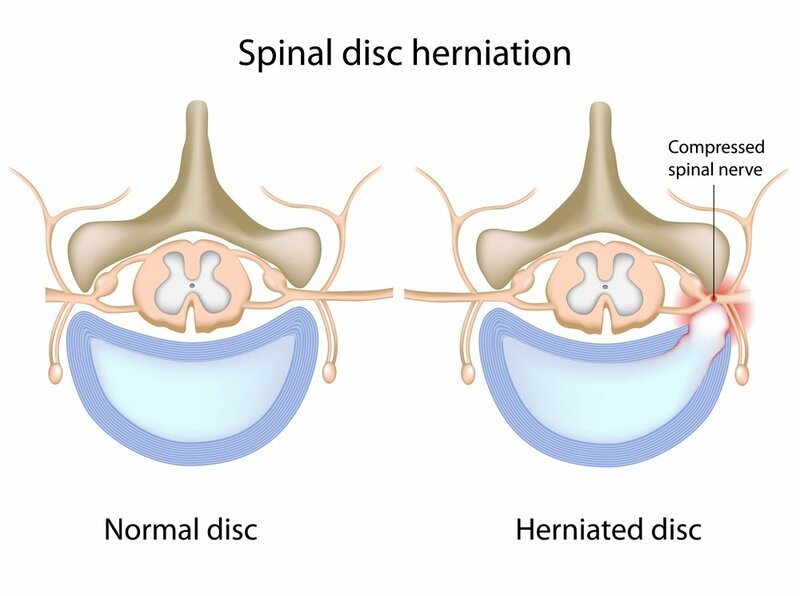 Only in very rare instances will surgery be considered for a herniated disc, and reserved for cases in which less invasive therapies prove ineffective. Surgery will only be recommended when the herniated disc results in persistent numbness or weakness in the extremities, loss of bowel and bladder control, or issues with standing and walking. If you would like more information about treatments for a herniated disc, be sure to contact our advanced neck and back pain center today. Dr. Luis Manuel Tumialán will work with you to restore wellness and mobility.